I made a simple cozy breakfast for you. I’ve mentioned before that breakfast is my most fav meal of the day. I feel like feeding myself well in the morning sets me up to have an awesome rest of the day. Plus I tend to take my time in the mornings after Little One goes to school. Self-care and good eating are top priorities while I’m on my healing path. I went through a little waffle phase after I got my new waffle maker. Savory sweet potato waffles have been on repeat since December. I’ve been freezing them and popping them in the toaster oven in the mornings with my poached eggs. So good. And so easy. I’ve also been making a super simple breakfast that I wanted to share with you today. We tend to have a lot of leftover cooked sweet potatoes around here, so in the mornings I’ve been serving them for breakfast. 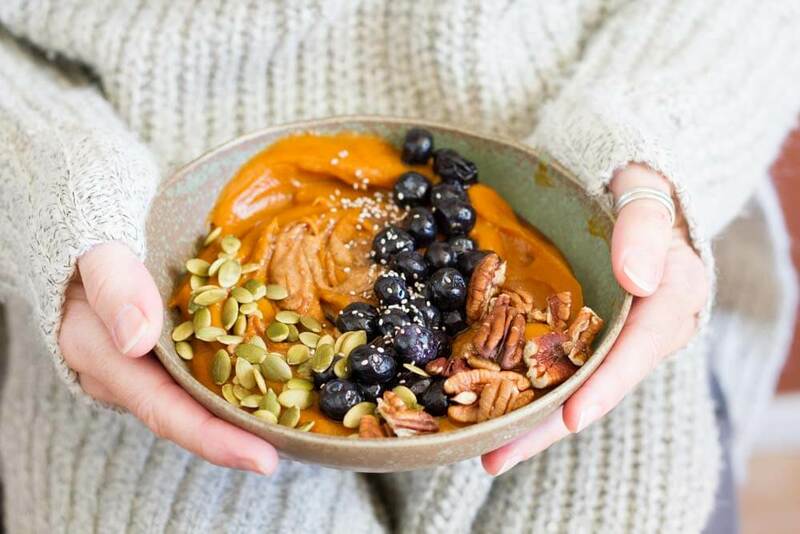 I’ve decided that a warm and comfy bowl of creamy sweet potatoes loaded with all the good things = breakfast heaven. Some of the best things in life are the most simple things. 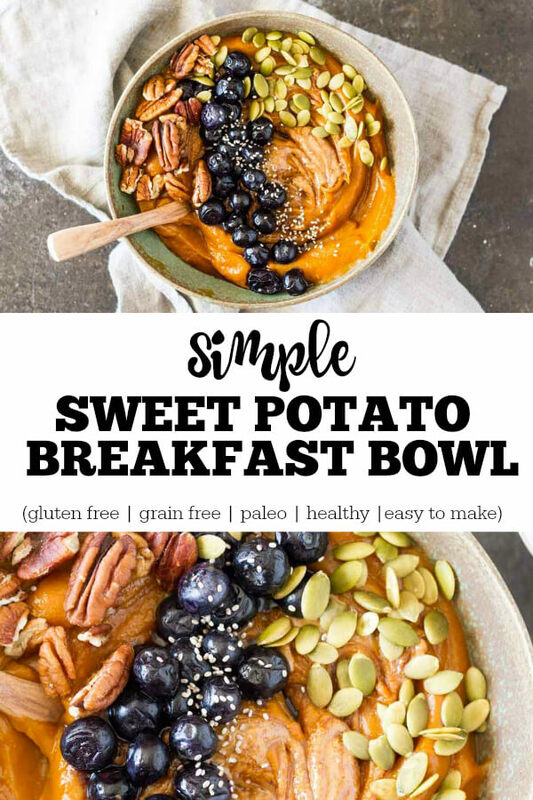 This Simple Sweet Potato Breakfast Bowl falls into that category. 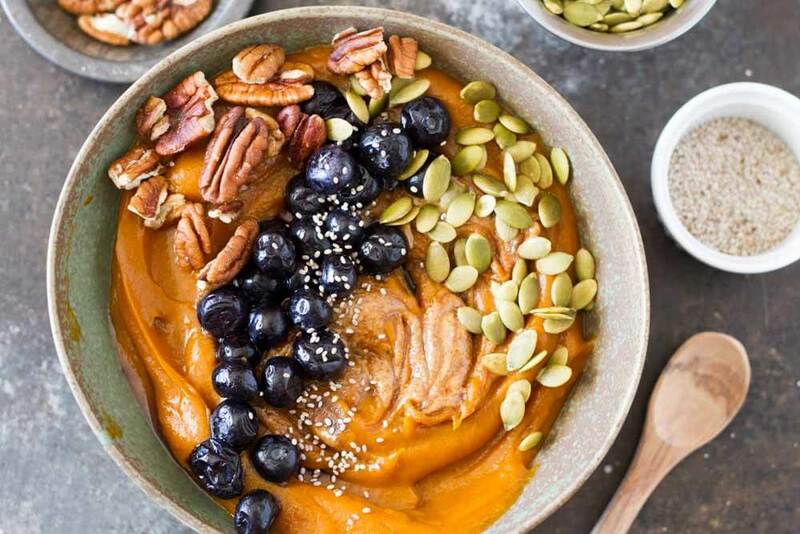 With very little effort, you can fuel yourself with a bowl of nutrient-dense goodness. Sweet potatoes are a powerhouse of vitamins and minerals. And you can load it up with anything that makes you happy. collagen peptides – a half scoop of THIS vanilla-flavored one has 9 grams of protein. Because I’m a creature of habit, I’m guessing that this breakfast bowl will be on repeat until I’m on to the next thing. 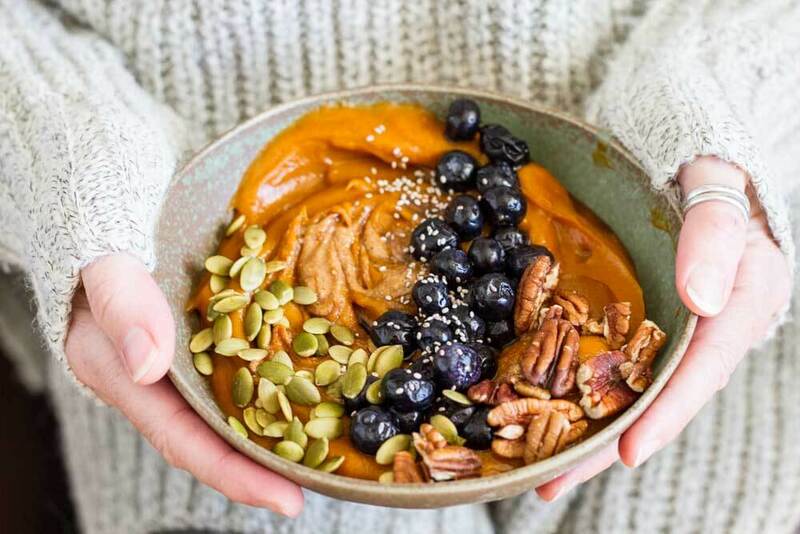 If you’re looking for me, you know where I’ll be: sitting at home, having a slow morning, cozying up to a bowl of warm, delicious goodness. Big love to you all. We are in this thing called life together. We might as well celebrate it. Warm sweet potato (if not already warm) in toaster oven or by lightly steaming it. Place peeled sweet potato, milk, and cinnamon into food processor. Puree until creamy smooth. 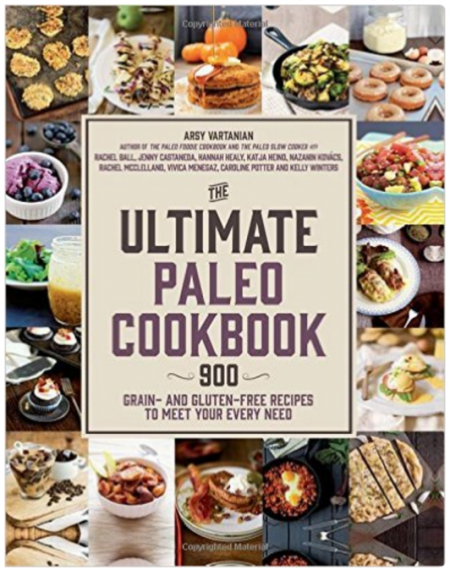 Add optional collagen peptides and/or sweetener, if desired. Add whatever toppings make you happy. Serve warm or room temperature. * If you don’t have already cooked sweet potatoes, simply bake whole sweet potatoes at 400’F until very tender. I like to bake mine in my dutch oven as they get nice and soft. But you can just bake them whole on a baking sheet as well. Just rinse them, poke them with a fork a couple of times, and bake. ** I find the sweet potato to be plenty sweet on it’s own. If you want to add a bit of extra sweetness, you can add 1 tablespoon of maple syrup of half of a very ripe banana. I looooove breakfast bowls! This one looks delicious! What a beautiful and nourishing bowl!! 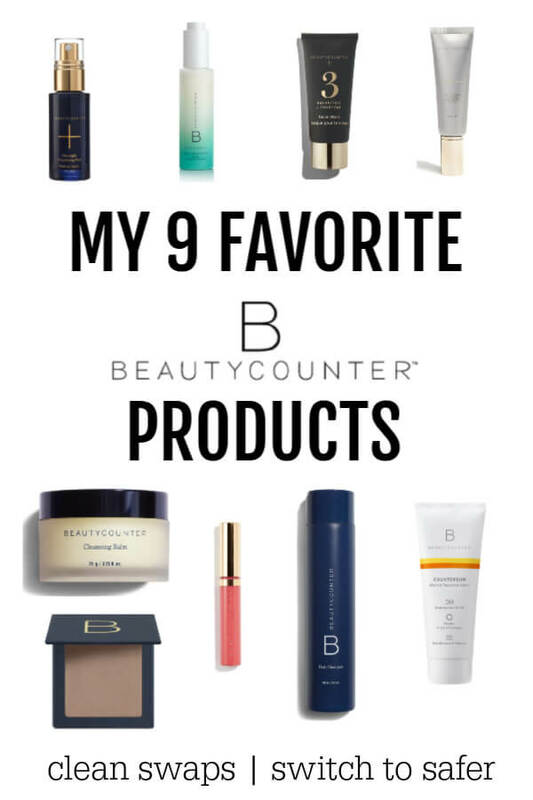 I’m so glad you shared your new favorite! I’m totally a waffle girl, too, about 6 days a week; but I love this idea with eggs on the side! This is my youngest’s favorite type of breakfast. I feed her sweet potatoes mixed with lots of stuff for breakfast so it would look like her sister’s oatmeal when she was a baby and it just stuck! Love all of your add in ideas! Thanks! Thanks, Renee! Your kiddos eat so well. You’re a good mama! 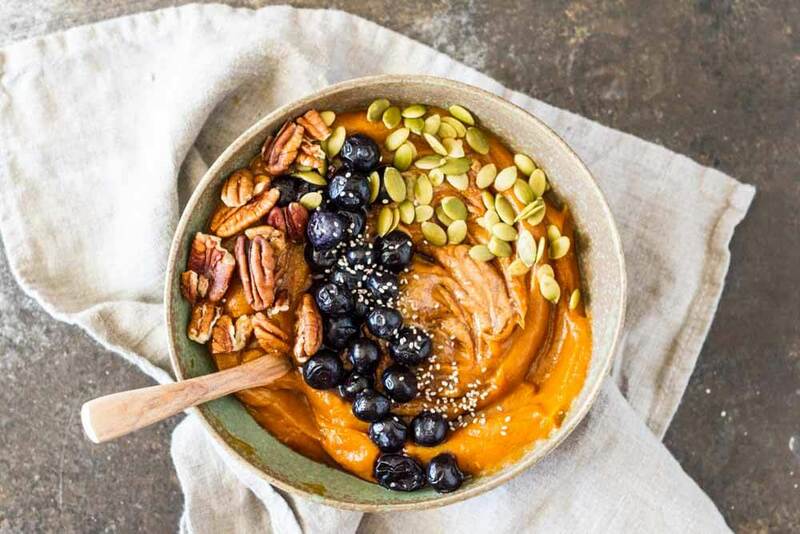 This is just the prettiest breakfast bowl! I love sweet potatoes for breakfast. 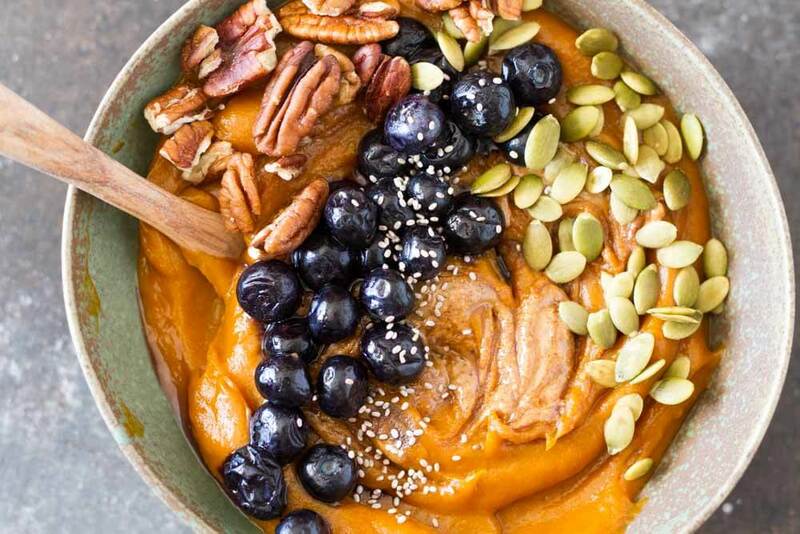 Oh my, I simply adore sweet potatoes, so this looks right up my alley! Coconut butter, cinnamon and maybe some orange…I can’t wait! I love your topping ideas! Coconut butter. YUM!! I love your description. Thanks, Irena! I am SO excited to try this recipe out. I saw it the other day on Pinterest and it immediately went on my list of “to try”! I still have never made a smoothie bowl, I’m in a rush in the morning so it’s in a jar and I’m out the door. I love the art and visual appeal of them, it is beautiful! 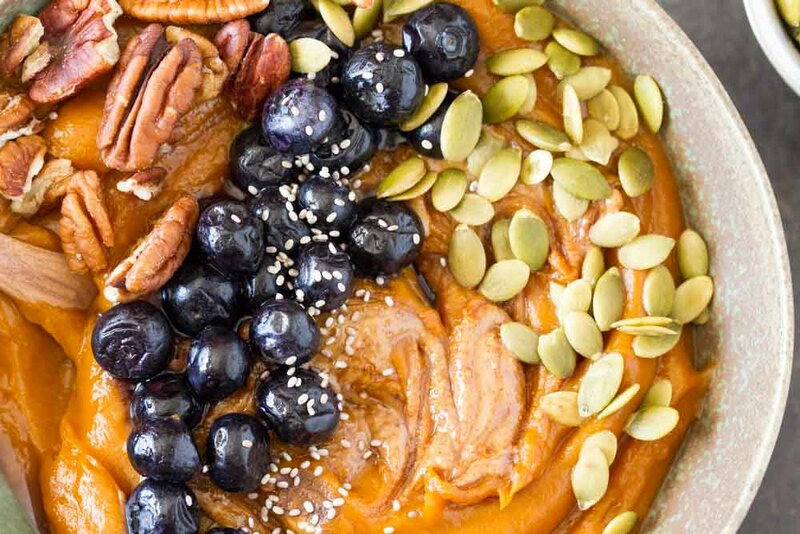 This looks incredible, and it’s perfect timing too because I have lots of sweet potatoes and I’m trying to cut down on the amount of eggs I eat! Yay! I tend to eat eggs almost every day, so this is a nice switch. Enjoy! MmmMmmMmm! 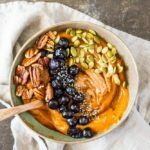 I love this breakfast bowl- my kiddo can’t get enough! My kiddo loves it too. She loves loading it up with all of her favorite things. YUM ! this is so creative. I love it ! It’s so easy, especially since I always have leftovers sweet potatoes. It’s a nice change form eggs.